Summary: Loggerhead nest numbers in Florida have been declining since 1998, raising concern among the scientific community and the general public because approximately 90% of all loggerhead nesting in the Southeastern U.S. occurs in Florida. The reasons for such decline are unclear. As population estimates are based on nesting activity, the decline in nest numbers may reflect a decline in the adult nesting population. However, reduction in nest numbers might reflect a change in the relationship between feeding ecology and reproductive output. Here, we will continue and expand the research we started in 2009. This project intends to investigate reproductive parameters, life history trade offs, movements and feeding habits of loggerheads nesting at the Archie Carr National Wildlife Refuge (ACNWR) using satellite tags in cooperation with the Caribbean Conservation Corporation, stable isotope analysis and more traditional techniques. The information gained from this study will improve estimates of adult nesting population size, identify movement patterns and expand the knowledge on feeding ecology. Moreover, the combination of satellite tracking and stable isotope analysis has the potential to elucidate the relationship between foraging activities and reproductive output, addressing one of the hypotheses for the apparent decline in loggerhead nest activities. Thus, this study will ultimately facilitate the ability of managers to make important conservation and management decisions for this threatened species that has incurred a 43% decline since 1998. Results: Over the course of the 2009 and 2010 nesting seasons, we tracked a total of eleven loggerheads: four individuals carrying both FastLoc GPS/Argos satellite units and VHF radio transmitters, three individuals carrying only Argos satellite units and four individuals carrying only VHF radio transmitters. All satellite units were deployed as a part of the collaboration between the UCF Marine Turtle Research Group and the Sea Turtle Conservancy. One of the main objectives of the present research was to assess intra-seasonal clutch frequency. To maximize the chances of selecting first time nesters and increase the probability of re-sampling those individuals, we deployed all tracking units at the beginning of the nesting season and only on turtles previously flipper tagged by the UCF Marine Turtle Research Group and found nesting for the first time in the 2009 and 2010 season, respectively. To encounter and sample the tracked turtles during subsequent nesting episodes we physically cover the beach with an ATV in days of expected return and use the “Argos almost real time email service”. Over the season we were able to re-encounter and sample all tracked turtles several times. Each time we collected samples for stable isotope analysis (blood, skin, scute biopsy and one freshly laid egg). From a tracking movement standpoint, we received good location points for all satellite-tagged turtles during both the inter-nesting period and post-nesting migration. 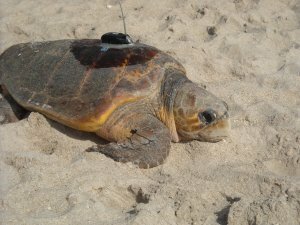 With regard to post-nesting migratory movements, 5 of the seven individuals fitted with satellite tags exhibited a northward seasonal continental shelf-constrained path to waters off the coast of Virginia and North Carolina. The remaining two females migrated south to waters surrounding the Bahamas and Florida Keys where they took up year-round residency. During the 2011 nesting season, we encountered Bitey, the female that was tracked in 2009 and moved to the Bahamas. We replaced her satellite tag and followed her post-nesting migration to the Bahamas for the second time. Our tracking data for this individual support site fidelity to foraging ground in adult female loggerheads. With regard to stable isotope analysis, we analyzed two categories of tissues: tissues with slow turnover rate (red blood cells, fresh-yolk, un-hatched egg, skin) and tissues with fast turnover rate (serum and albumen). The former should reflect an integration of diet and habitat used by the female prior to migrating to the nesting ground, while the latter should reflect the habitat and diet of the female’s last few weeks. The stable isotope results for tissues with slow turnover rate showed that individuals that headed to northern foraging grounds have isotopic signatures similar to the loggerhead population of the Pamlico-Albemarle estuarine complex of the North Carolina coast (Wallace et al. 2009, McClellan 2010). Isotopic variability in both δ13C and δ15N among individuals allowed discrimination of two distinct feeding aggregations: northern and southern aggregation. We attributed differences among females in 13C and 15N to a latitudinal gradient and to a baseline shift in primary productivity, respectively. The results of all slow turnover rate tissues were in agreement suggesting that any of these tissues could be used to assign post-nesting foraging ground. However, this conclusion should be interpreted with caution, as the current sample size is extremely low. If data obtained with more satellite tags support the relationship between foraging ground location and isotopic signature we have found so far, we could assign foraging grounds to the larger pool of nesting females we have sampled in 2009 and 2010 for stable isotope analysis (n=130) providing a better representation at the population level. The stable isotope results for tissues with fast turnover rates were inconclusive. The goal was to investigate whether females forage during the nesting season and if so, whether food acquired contributes nutrients to the clutches of eggs the female will lay that same season. We found no clear trend in the data. We provide two alternative but not mutually exclusive explanations for the lack of trends: 1) there is individual plasticity in strategy (some females eat and others do not) and 2) the turnover rate of serum and albumen in sea turtles is slower than expected and cannot be used to address the questions of interests. Our sample size is too small (only 9 females were sampled repeatedly during the nesting season) to test the first hypothesis. Serum and albumen have been successfully used to address similar questions in birds. However, birds have higher metabolic rates and, thus, faster turnover rates than reptiles. Moreover, adult sea turtle tissue turnover rates are unknown. Studies conducted on small loggerhead juveniles and adult red ear sliders suggest that plasma half-life is 22.5 days and 35.6 days, respectively. We are currently conducting a captive study sponsored by the Sea Turtle Grant Program to determine the turnover rate of both slow and fast tissues (serum, red blood cells, skin and scute) in order to correctly interpret data collected in the wild. No similar study can be done with regard to fresh eggs.